What is Rinoa's Job Class? The job class battle system is a classic staple in Final Fantasy tradition. Because it is not played straight in recent games, it's a fun hobby of gamers at forums to figure out which characters could belong to what job class. While characters like Quistis (Blue Mage) and Irvine (Gunner) are easy to identify, Rinoa has been notoriously difficult to classify because of her hybrid qualities. Furthermore, the FF8 junction system deviates from other battle systems in that all characters can be assigned to almost any role. I'll tell you right now: There is no perfect, undisputed job class for Rinoa. The following are my personal conjectures about what class theories are reasonably "good enough". Due to the junction system's flexibility, I'll focus mostly on what makes the characters unique in battle - weapons & limit breaks. Description: Black mages specialize in offensive magic spells. They usually have the highest damage inflicting spells in the game, not including blue magic or limit breaks. Their limit breaks often involve enhanced casting ability. Strengths: Rinoa's second limit break, Angel Wing, puts Rinoa in a magical berserk state where she continuously casts strong black magic spells. She does not cast curative magic. In this state, all her magic spells do up to 5x more damage, and she can access strong spells like Ultima. A major part of the storyline is that Rinoa has is a sorceress, an identity commonly associated with offensive magic. Additionally, Rinoa has the best base magic stats out of anyone in the game. Weaknesses: While I like this theory, the biggest problem is that it ignores Rinoa's physical attacks. The traditional black mages are strong magically but weak physically. Not only does Rinoa have the highest strength stat, she deals substantial physical damage with her Angelo attacks. Mini-Conclusion: This is the best fitting job in connection with her final role in the story, but fails to explain her initial battle style. Description: Beastmasters, also known as Trainers or Mediators, fight by commanding animals to attack. They have been seen carrying a variety of weapons. Their attacks and stats make them physical, offensive attackers. Some also can control and capture wild monsters. Strengths: This perfectly matches Rinoa's first limit break, Angelo, in which she utilizes her dog Angelo to attack enemies with physical attacks. The blaster edge is not a traditional magic user's weapon. 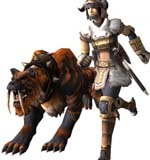 Other beastmasters, like Relm and Cait Sith, also had unusual weapons. Weaknesses: Opposite of the last theory, this idea explains one limit but ignores the other one, Angel Wing. Magic is a huge part of her character, both in gameplay, stats, and storyline. It would be silly to ignore that simply because Angelo came first. Mini-Conclusion: Best fitting job in connection with Combine and her weaponry, but fails to address her strong magical talents. Description: Red Mages can use both Black Magic and White Magic, and also are proficient at physical attacks. Red mages are known as jacks of all trades, but cannot access top-tier magic spells. Strengths: This addresses both of Rinoa's limit breaks (Angelo - her physical one, and Angel Wing - her magical one), her weapon, and her story identity. Her magical berserk mode supports a Red Mage conclusion just as much as it does a Black Mage conclusion. Rinoa is a hybrid of attack styles, and the Red Mage is the oldest, original hybrid class. Weaknesses: Unlike a traditional red mage, Rinoa can access high level spells. In fact, high level spells are a part of her Angel Wing limit break. Rinoa doesn't have any motifs of a red mage either. This theory is my personal favorite, but it can't address how Rinoa excels at magic. Mini-Conclusion: Best compromise, but lacks in connecting her strengths. More notable suggestions, plus a super-quick overview of pros and cons. Ninja: Fits her long range weapon (weapon names too!) well, but Beastmaster better explains first limit break. Also ignores strong magic stats. Sage: Another hybrid magic class, like Red Mage, but does not address Rinoa's potent physical attacks. Sages are physically frail as well - Rinoa is not. Thief: Thieves often have long-range weapons similar to the blaster edge, but it doesn't fit her personality or her first connection with Angelo. White Mage: Because of her angel wing symbols and magic affinity. Cannot explain many of the factors considered in our discussion.